Staying in Touch with Recruiters: Yes, you should! Checking in is a low-effort-requiring and yet extremely meaningful opportunity to again illustrate your value in your recruiter’s work. In order to do so, send a quick email, or ask to meet for a quick bite to eat or cup of coffee. Your email can be as short as a paragraph or as long as an essay, but make sure to include an update of how you are performing at your company, if you are happy in your position, and reiterate your level of gratitude for their help. Also remember, it is always kind to ask questions! A simple, “how have you been?” or “how has your business been going?” goes a long way. In addition to checking, feel free to address any inquiries you have about your work field. In combination with resume building, recruiters are amazing resources for providing market value and information, and expanding professional networks. 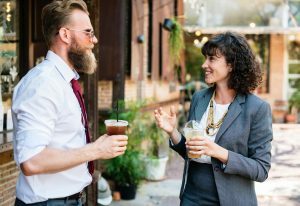 By connecting with new people every day, recruiters rapidly build their networks, and you can easily receive help from them if you are looking to expand your own (even if you are just looking to reach out to another professional in a similar position in your career, or better, your “dream” job!). Recommend your recruiter to others if you had a pleasant experience! They did a great deal of work for you, and “returning the favor” by recommending them to others is another substantial way of saying, “thank you.” Another way to do this is by leaving a good review. Whether on their LinkedIn page or on another website, recommendations are vastly important. Boost your recruiter’s reputation and professional footprint by exemplifying how great of a job they did for you through a recommendation. On the other hand, if you believe you know a person who would be a great candidate for a position your recruiter is filling, recommend them to your recruiter. You never know if you could potentially be making your recruiter’s job much easier by supplying them with their new, best candidate! Contrary to popular belief, recruiting is not a one-way street. Help your recruiters in the same way they helped you by following these simple steps and you will absolutely form a lasting, meaningful relationship with your recruiter. Now go send that check-in email, write that recommendation, or grab that cup of coffee! 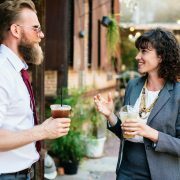 Searching to connect with some great recruiters? Look no further! Enjoy this blog? Check out some more! https://esquire-recruiting.com/wp-content/uploads/2018/06/adult-beard-beverage-551652.jpg 1234 1800 Esquire Recruiting https://esquire-recruiting.com/wp-content/uploads/2017/08/esquire-recruiting-chicago-300x138.png Esquire Recruiting2018-06-07 14:07:252018-06-07 14:07:41Staying in Touch with Recruiters: Yes, you should!